Gender expression and clothing is explored throughout the project or(between)not. or(between)not was inspired by Bending, a collective performance piece which started in 2013. Bending consisted of enacting conversations about gender expression through textile, photography and performance. About sixty participants (queer, straight, and questioning) were invited to engage in discussions on the subject of clothing in relation to gender expression. The participants were provided with items of clothing to interact with, and in certain instances these interactions were photographed and/or audio recorded. Many of the resulting images displayed the participants adorning clothing they would usually not wear, while juxtaposing their body language with how they thought it ought to be based upon the garment chosen. Bending resulted in a complex communal dialogue about how gender expression through attire comes to fruition or does not. It also served as an introduction for many participants to gender bending, deconstructing the gender binary, discussing the terms “trans” and “non-binary”, and having candid conversations about how gendered expectations shape daily life. As many of the participants were uncomfortable with the photographs and conversations being displayed or heard, the ideas explored in Bending were carried forward by using the items of clothing to create the wearable cloaks for or(between)not. The reuse of the clothing used during Bending is rooted in Müller St. Thomas’ interest in the past life of things and the emotional connections between objects and humans. Therefore, the history of touch is an important yet invisible element for or(between)not. By sewing together pieces of different garments, the artist fuses the varying histories of the fabrics, including the gendered bodily interactions and the at times difficult and engaging conversations that took place during Bending. However, the nine cloaks are considered a related yet separate project to Bending. The textile pieces are meant to highlight the protective nature of the cloak and have been sewn through patching to reference quilting and the comfort associated with quilts—allowing the cloaks to become symbols of queer protection. 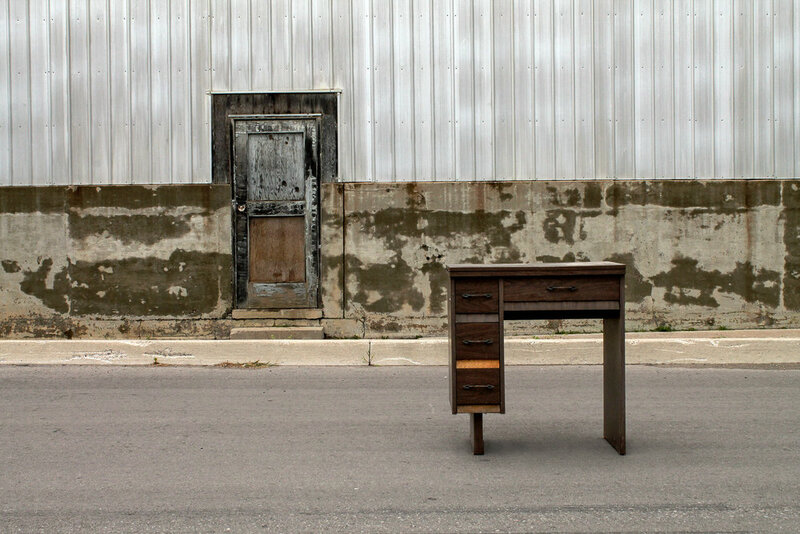 Unsettled Attachments is an ongoing performance project that involves artist Amber Helene Müller St. Thomas moving household items and furniture within the public sphere. The objects are taken from their usual (or rather: expected) place within the home, and situated within an unfamiliar context. Indeed, a bed in a parking lot and a lampshade placed within a back ally appear odd and out of place. This gesture evokes layers of meaning that facilitate Müller St. Thomas to investigate desires, spaces, human relationships, and object/human connections. For Müller St. Thomas, there is a link between inanimate objects and intimacy. Having been raised within a household of hoarding, objects have been omnipresent since their childhood. There has always been something in close proximity that may stimulate, be touched, shared or held. The items chosen for Unsettled Attachments are mostly used and worn as the artist is interested in the past life of an object and the history of touch it carries. The project aims to make space for queer representations of objectum sexuality, or the desire of objects. Things hold the potential to act as surrogates for attachment and also as markers of desire. The act of moving furniture and placing objects in such a precise manner shows a certain affection with a high level of tactility and concern. Müller St. Thomas additionally refers to the movement and documentation of the objects as “an alternative system of queer cartography” through which the crucial factor remains the shifting placement of the item. Furniture holds an association with traditional notions of femininity. As there lives a certain disdain for “womyn objects” and “womyn spaces” it is interesting to see how these objects are perceived when they are literally placed outside their “usual” context. The gesture of moving the items may be perceived as a method of things subjectively “femme” taking up space. Müller St. Thomas is interested in unusual gestures in communal places as a method to incite curiosity. The act of performing in the public sphere (instead of the gallery or institution) not only allows art to be brought to a wider audience; it also facilitates spontaneous interaction. Regardless, however important these unplanned encounters are, in the end, the photographs have an aesthetic value and the personified objects seem to be placed in their new environment with great care — which is what keeps the post-performance-viewer from feeling like these are snapshots of items lost in the city. Noitadilosnocer (the word “reconsolidation” spelled backwards) refers to a practice where memories can be reprocessed through EMDR therapy (eye movement desensitization and reprocessing therapy). The project entails seeking out, looking at, touching, and smelling, Worldwide Church of God doctrine in its original form and then reconfiguring the objects through manipulations involving fire, cuts, collage and stitching. The gestures used encouraged the artist to process and reconsolidate memories, things and symbols connected to childhood religious structural abuse. Müller St. Thomas was a member of the Worldwide church of God until they were 14 years old when they cut ties with the organization and refused to continue attending services. Worldwide was a popular cult in the eighties that has since disbanded (although many different offshoot organizations remain). The church was known for its stringent rules concerning tithing. The queerphobic doctrine used for the project is in many instances altered beyond recognition through artistic methods that subjectively may be considered queer (such as bending, reversing, and “making backwards”). In a related performance piece, Saturday Study with Snack, Müller St. Thomas used symbolic elements of the Worldwide Church of God to question the church’s doctrine, beliefs and practices. During this performance, the artist constructed a circle made from planted pea shoots that were growing of out burned doctrine. The artist then (positioned in the middle of the circle) utilized a Worldwide hymnbook and sang hymns backwards. This repositioning removed the songs from their original connotation and gave the artist agency over their meaning. Through these movements of reconsolidation and reframing in both the performance and Noitadilosnocer, the artist reclaims agency and queer expression. With the experimental project I Could not Discern the Form Thereof, Amber Helene Müller St. Thomas seeks to pose questions concerning the visual representation of queerness. Can alternative queer symbols become recognizable without morphing into signifiers used within homonationalistic agendas? How do nationalism and its sensory-symbolic representations dictate embodied experiences such as queer and gendered subjectivities? The object-flags are created in a playful manner. They are primarily made from cast-off materials that were found by the artist in shared locations of production. By using discarded yarn, studio materials, and embroidery thread to create intuitive sculptures, the artist explores the endless variables of queer representation. The knitted stitches and the half-hitch knots used to produce these symbols visually display the elaborate time it took to create every piece. It shows the tactility of the handmade, and focuses on actions primarily associated with ideas of the home, comfort, and belonging, which allowed the artist to juxtapose these concepts with the realities of queer representation and existence. Müller St. Thomas' instinctive creation process values failure and objects deemed non-functional. Recycling materials and using objects that have been considered unfit for further use or even creation is a repeated theme within their works. This approach highlights the history of touch within the object, as well as the artist's desire for unwanted objects to be utilized for the production of alternative queer symbols and artifacts. 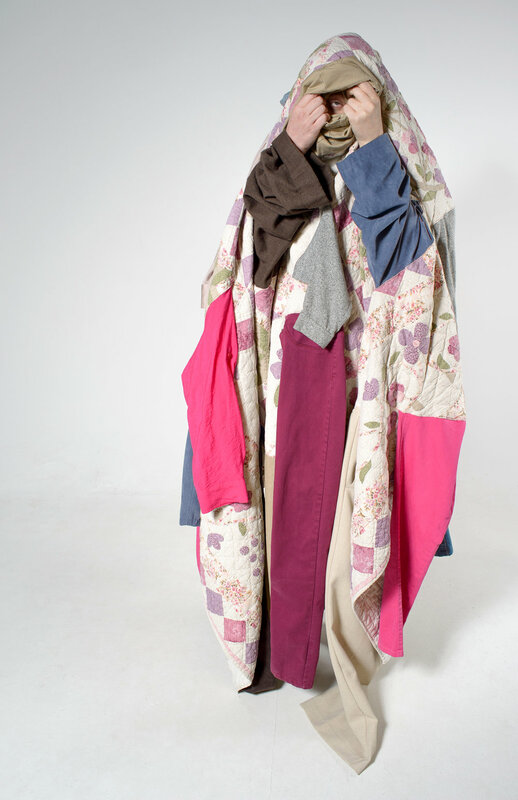 I Give, You Give, We Give is a continuing project in which artist Amber Helene Müller St. Thomas uses recycled clothing as a medium to stimulate conversations about touch and queer desire. They are interested in the protective quality of clothing, be it from a stranger’s gaze or from the natural elements. Müller St. Thomas believes that objects (especially textiles) have the capability to carry their history of touch. This component of intimacy is a pivotal concern for the project, I Give, You Give, We Give. The clothing used for the project was first passed to friends and loved ones who identify as queer, and these participants were encouraged to touch, try on, and sleep beside the textiles. This history of queer touch is imperative to the work, as the resulting quilt exhibited gave audience members an opportunity to touch items with a history of queer intimacy. Cut pant legs and shirt sleeves were attached to a quilt, and to each other, in such a manner that one may still place limbs through the orifices should they choose to, while the original purpose of the items was no longer served. This was done to emphasize an interest in the textiles functioning as objects for touching. I Give, You Give, We Give was set up as an installation at the MFA thesis exhibition of Müller St. Thomas. It was composed of a bed, the aforementioned altered quilt and textile pieces, and a supporting text that discussed the history of queer touch. The bed — an item that is highly connected to attachment, intimacy and connection — invited the audience to interact with the quilt, enticing the viewers to touch and interact with the fabric. This action puts the viewer in a position where their interaction becomes part of the object’s ongoing history of touch. Müller St. Thomas’ is interested in viewer participation and communal gestures, as participation directly connects to queer community building; which may begin when gestures of inclusion open possibilities for enactment and discussion.